We welcome local citizens such as yourself, of various professional and personal backgrounds who observe common needs and share common goals. Step out of your 'Comfort Zone', accept the challenge and be part of an active and motivated TEAM. Working together we can help our Hispanic community assimilate into the future while continuing to preserve the past. 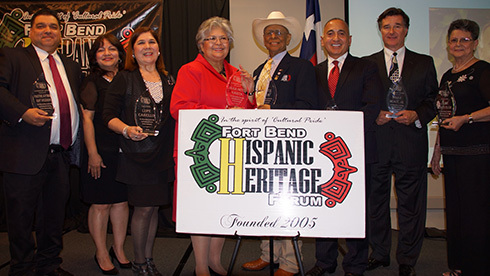 In the spirit of "Cultural Pride', the Fort Bend Hispanic Heritage Forum embraces all Hispanos in recognizing our heritage by instilling pride and respect for the rights of people everywhere to enjoy the fruits of freedom. We accept ANY AMOUNT of monetary donations. Friends of the Forum has 2 levels for Scholarships in the Family/Company Name. Every year, we ask people to nominate a person from the community along with biography and photos. We encourage EVERYONE submit the Nominees information to FBHHF. Our mailing address is Fort Bend Hispanic Heritage Forum, P. O. Box 1624, Rosenberg, TX 77471. 2018 Recipients of our Annual Community Leadership Awards last night as we honoured Pastor Anthony Ray Becerra, John F. Healy, Jr., Gloria O. Garcia, and Robert Gracia ... along with our Board of Directors: Linda Rubalcaba, Lupe Cabello, Joe Vera, and Janie Warstler.